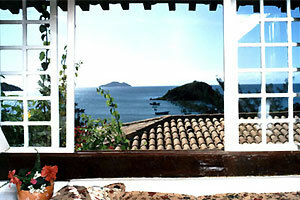 The Pousada Vila Do Mar Hotel sits on the hillside of the Humaitá headland, located by the beach. Though over 500 years have passed , a great part of this region remains preserved. Here the sun shines almost all year long , lightening the beauty of its beaches of the warm and calm waters that are rich in corals and reefs, many of them occurring in high sea. 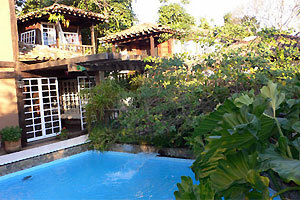 Pousada Vila Do Mar Hotel is situated between Armação and Canto beaches in the center of Buzios. The suites, in a total of 18 accommodations, each having a verandah and equipped with private bathroom with water solar heating, ceiling fan, TV , Pousada Vila Do Mar Hotel offers a swimming-pool by the sea, jacuzzi bath tub, beach bar and deck with easy chairs, beach blankets and umbrellas. All of this in the middle of the shade of the coconut trees. Television / video room and equipment rental and lessons in windsurfing and scuba diving are available. When would you like to stay at Vila do Mar Buzios Hotel ? 1) Rates at the Vila do Mar Buzios Hotel may not be valid during Carnival, New Years, Easter and other special dates. 2) Prices in US Dollars and subject to change without notice. 3) Brazilian Visa Required of US citizens, Canadians, Australians and many other countries. 4) Website is for research purposes only. Get our free updates on the latest deals, news and articles about Buzios and other destinations.